It just stuck me that I have not written anything about this favorite book of mine- The Lord of the Rings by J.R.R.Tolkien. An epic fantasy, this was initially written as a sequel to 'The Hobbit'. There are three parts to this book and they are as follows: 'The Fellowship of the Ring', 'The Two Towers', 'The Return of the Ring'. One day, I hope to hold the first edition copies of this brilliant book. I haven't watched the movie yet and I think, the joy of traveling through the world that this genius painted for us is in itself a pure joy and I don't think looking at the movie will do justice to that. Of course, the very same reasons for not watching the Harry Potter Series too. Well, as of now, I do not intend to watch it but who knows what I will do later ;). This post is not about the book as you can read it if you wish to and enjoy the magic. This post is about the little hidden facts and points about the author and this whole series. I should thank Mental Floss, my favorite magazine for helping me look for details and of course, I also found a few others from the various great sites that are for just Tolkien fans. John Ronald Reuel Tolkien was born on January 3rd 1892 and he left this world in the year 1973. He was a close friend of C.S.Lewis (The Chronicles of Narnia) and he was a part of the literary group called 'The Inklings'. It was an academic group with the great writers like C.S.Lewis, J.R.R, Owen Barfield, and Charles Williams. They used this group to review the unfinished works of each other. J.R.R was a professor at Oxford University and was considered a wonderful instructor who loved to teach. He was a very loving husband and his wife, Edith and him were considered the most loving couple. He was a philologist and did create many languages which you can see in his books. 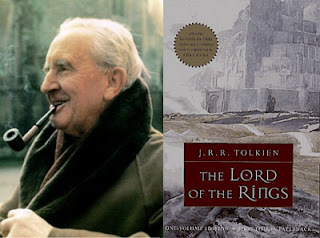 I love his writing style and every time I read the Lord of the Rings and its beautiful poems and songs, I feel like I am in that new world with Frodo, Sam, and the other good friends.That is the charm of a great writer. Brain Pickings had shared one wonderful audio on sound cloud that plays JRR's reading. Do listen to it here. I end with a couple of my favorite poems from this book. The first one is 'Road goes on and ever ever on...." and then of course, the one about the ring.